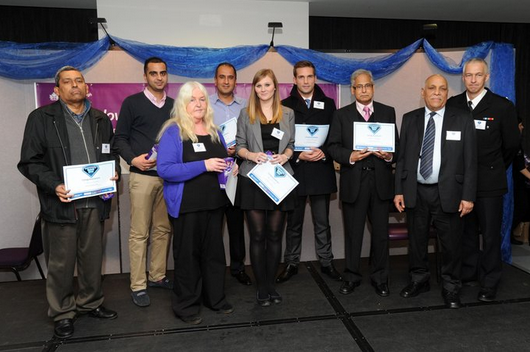 A number of people, from Neighbourhood Watch stalwarts to leaders of residents groups, were honoured at the Hounslow Community Safety Heroes awards ceremony organised by Hounslow Council and the police. They were praised by police, fire and council chiefs for their efforts, which ranged from tackling antisocial behaviour in parks to arranging events in their neighbourhoods. Old Isleworth estate agency owner Michael Wright of Oakhill Estate Agents was recognised for the voluntary work he does at Feltham Young Offenders Institution, The Priory detox clinic and within the local community in Isleworth. Michael is committed to helping young men suffering from alcohol and drug addiction or from underprivileged backgrounds, to turn their lives around. After collecting his individual award Michael said: “It is a huge honour to be recognised alongside many others for the voluntary work I do in my spare time. Oakhill Estate Agents are based in Old Isleworth and provide both sales and lettings services.